Newspapers.com now available with your library card! Relive the Central Wisconsin Book Festival! Help out your Friends by donating paper bags! The Friends of the Marathon County Public Library are getting ready for their next book sale (August 2-5), but they need your help! The Friends are asking members of the public to donate paper grocery store bags to be used at future book sales. The bags are needed for the $6 bag sale usually held on the final day of each book sale, where folks can purchase as many books as they can fit in one bag for just $6. The paper grocery story bags can be dropped off at MCPL’s Wausau Headquarters any time the library is open. For more information, call 715-261-7240. Due to unforeseen circumstances, our Edgar Branch will be closed until further notice. We sincerely apologize for the inconvenience and hope to have the branch open again as soon as possible. Thank you for your understanding! Get Your Uniform Addressing Questions Answered at MCPL! Make the Most with Your Instant Pot! Read These Books Before They Hit the Big (and Small) Screens! 2018 is less than two weeks away and with it will come a slew of new movies and TV series based on several popular books and book series. Oftentimes when film and television adaptations premiere, the holds list for the books they are based on can grow rather long. But you can get ahead of the curve by reading some of these titles now before they hit the big screen or are broadcast into your living room! Top 10 Challenged Books of 2016! What to Read After "13 Reasons Why"
Make today your lucky day! Wausau Community Room Now Open at Wausau Headquarters! National Book Award Winners at MCPL! The 67th annual National Book Awards were held on November 16 in New York City. Authors and poets were awarded the coveted National Book Award in four different literary categories - Fiction, Nonfiction, Poetry and Young People's Literature. The winners of the 2016 National Book Awards are listed below. If you're inclined to check any (or all) the winners out, you're in luck; MCPL owns copies of each! Holiday Hits at our Spencer Branch! On December 6, the award-winning Spencer High School Handbell Choir performed an hour-long concert of holiday music for folks at our Spencer Branch Library. The concert was attended by more than 30 individuals from the Spencer area and included a mixture of traditional holiday songs! The handbell choir also recently competed in a record-breaking performance at the Mall of America on November 19, which broke the Guinness World Record for the largest handbell choir performance with over 650 people participating. Take a look below as the Spencer High School Handbell Choir performs the traditional French Christmas carol “Il Est Ne Le Divin Enfant” at our Spencer Branch! Summer is quickly winding down, which means the time to accomplish your summer reading goals is also running out. Just like us everyday Americans, President Obama has also been working through a summer reading list of his own, comprised of titles that are new to the market as well as blockbusters that have already captivated readers around the world. If you're looking for a few more titles to add to your bookshelf before summer officially transitions into fall (or if you just want to read like the leader of the free world), check out the books President Obama has been paging through over the past few months and give them a try! 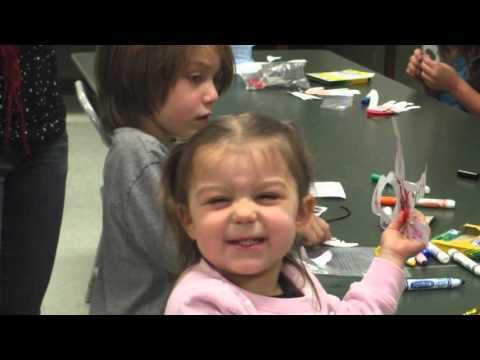 Here's a short video with historical and current pictures and video, showing the different MCPL locations over the years and clips from some of the diverse programming we provide in our communities. This video was created in the spring of 2016 and edited with iMovie. Enjoy! 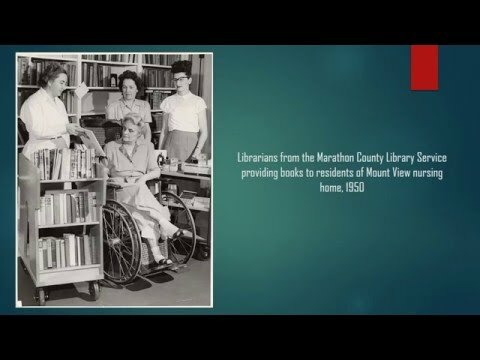 To go along with the 2016 NLW theme of "Libraries Transform," MCPL has put together a historical slideshow featuring images and information highlighting the many ways MCPL transformed, from starting as a small men's literary club in the mid-to-late 1800s to becoming a modern-day entity that serves the largest county in Wisconsin (by area) with nine locations. Watch MCPL's evolution and catch a glimpse of what the future may have in store! The Marathon County Public Library is celebrating National Library Week in a multitude of ways, including reflecting on the past, present and future! To go along with this year's NLW theme of "Libraries Transform," MCPL has put together a historical slideshow featuring images and information highlighting the many ways MCPL transformed, from starting as a small men's literary club in the mid-to-late 1800s to becoming a modern-day entity that serves the largest county in Wisconsin (by area) with nine locations. Watch MCPL's evolution below, and catch a glimpse of what the future may have in store! Get Ready for the Oscars with MCPL!